The theme for this challenge is black and/or party! Kimberly Greenlee with Stampin' Up is the sponsor for this challenge and she is offering a wonderful prize! I can't believe my baby is turning FOUR years old in a couple weeks! Where does the time go? We are in full party prep mode around here and this week I have been working on favors. The theme of her birthday party for this year is ICE CREAM! Yes, I know...what 4 year old doesn't love ice cream. 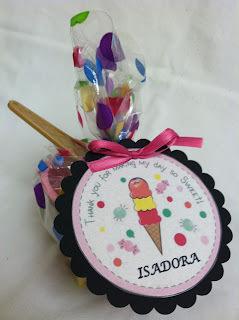 So I search the internet for ice cream party favors and you would be surprised how many amazing ideas there are. I settled on these adorable little ice cream cups with matching spoons. I also found some cute ice cream shaped candy to go inside them. Originally I thought it would be cute to personalize each one with name of the child that would receive it. But that proved to be a challenge for more than one reason. 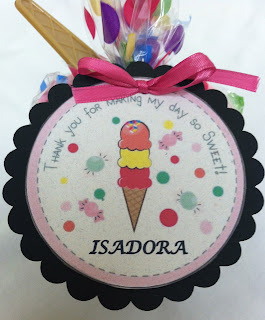 So instead I wrapped them up in fun polkadot paper and made a tag with Isadora's name on it for each one. When all was said and done here is what we have! A cute fun party favor that I think the kids are going to love. Now let's PARTY! Be sure to check out the other great creation from other design team members and to play along on the Craft us Crazy Challenge Blog! ADORABLE!!! They are going to love them! This is a darling party favor! Love the tag you created. Lots of fun! Oh what fun! I love this card!